Two friends are on a major mission to clean up beaches across the state of Florida. DELRAY BEACH, Fla. — Two friends are on a major mission to clean up beaches across the state of Florida. Bryan Galvin and Heather Bolint created Plastic Symptoms, an organization that aims to protect the environment and promote an eco-friendly lifestyle. "By now we've collected already a thousand pounds of plastic," said Galvin, who added they started their effort a month ago and hope to be finished by mid to late June. "We physically cannot carry all the plastic we're finding, which is why a lot of it, unfortunately, we have to leave behind," said Bolint. Bolint said they can remove 40 to 60 pounds of plastic off the beach each day. 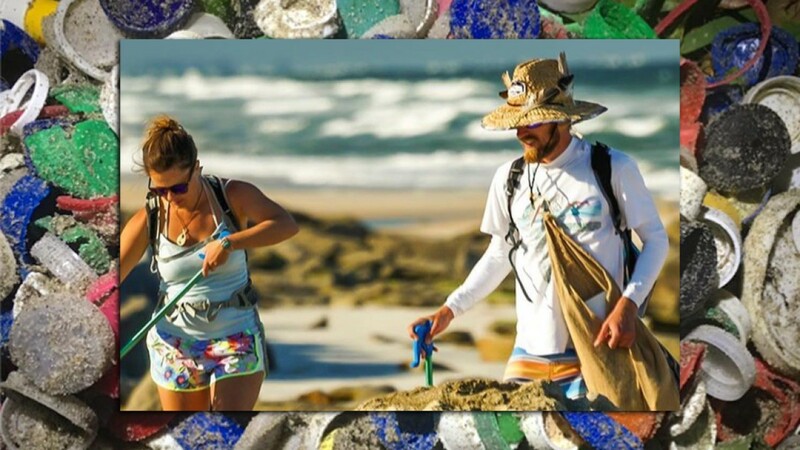 On Monday, PlasTrek took the couple to South Florida where they cleaned up beaches and offered important advice to beachgoers about protecting our piece of paradise. "The best thing you can do to clean your beaches, the best you can do to make an environmental impact is to mitigate that impact in the first place by refusing plastic in the first place," said Galvin.